Types of wines: Pale-hued, lightly fruity reds and crisp, fragrant rosés. 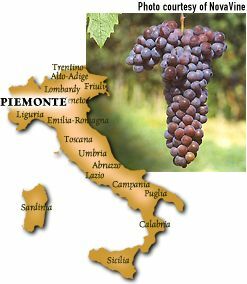 Origin: The Monferrato hills of Piemonte where it is produced by only a few wineries. Grignolei, its name in the local dialect, means "grape pips" and refers to the large number of such found in the variety, which provide Grignolino with most of its tannin structure. Description: Refreshing, somewhat tart, raspberry fruit characterizes both the aroma and flavor of Grignolino. Aging: Both red and rosé styles are best drunk very young, with a slight chill. Best location: Like its kinsman Barbera, Grignolino's naturally high acidity and slowness to ripen make it fare better in hotter climates. It grows best in dry, loose soils. FastFoodFacts: The rosé Grignolinos make wonderful aperitivos and pair well with raw shellfish. The reds are best with sausages, salami and other high-fat foods. Firm tannins make both styles enjoyable with double and triple creme cheeses, especially Taleggio.